Stainless steel bracket which can be rotated or angled up an down. This ultra wide angled bullet camera uses the latest technology to give a number of useful screen modes. 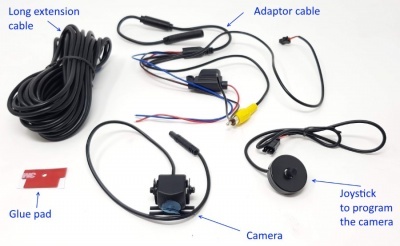 It can be programed to make it suitable for use as a rear or front facing camera. It is designed to mounted at a tilt of 35 degrees. At this agle there should be no distortion. 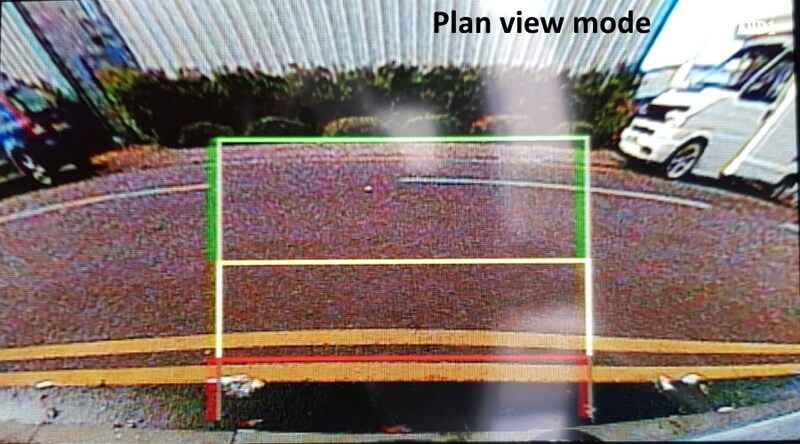 Our photographs were taken with the camera at number plate level looking out horizontally. 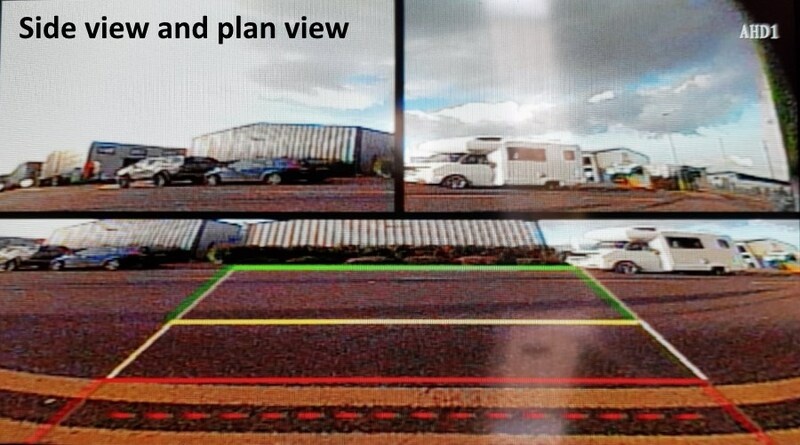 The lens of the camera had no obstructions along a straight line path from the camera across the front of the vehicle. It has 6 screen modes that can be selected using the controller. 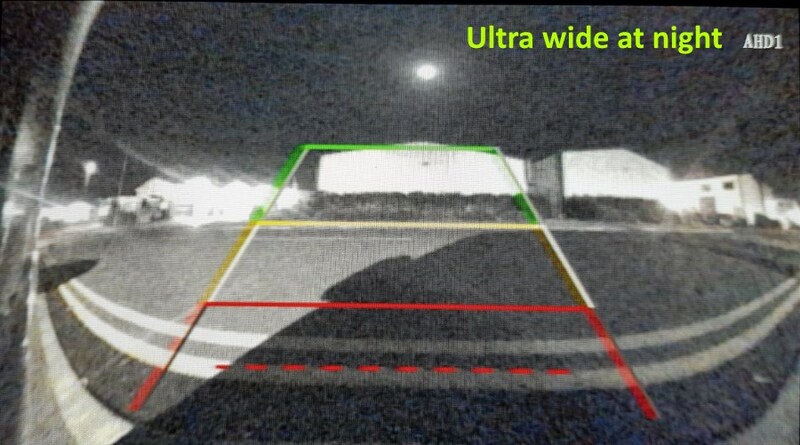 Although a CMOS camera it gives good night vision in areas where there is street lighting. It uses one of the modern CMOS sensors that have equal or better performance than CCD. The folowing set of photographs were taken mid-winter rather late in the day. This photograph shows it in the ultra wide angled mode. 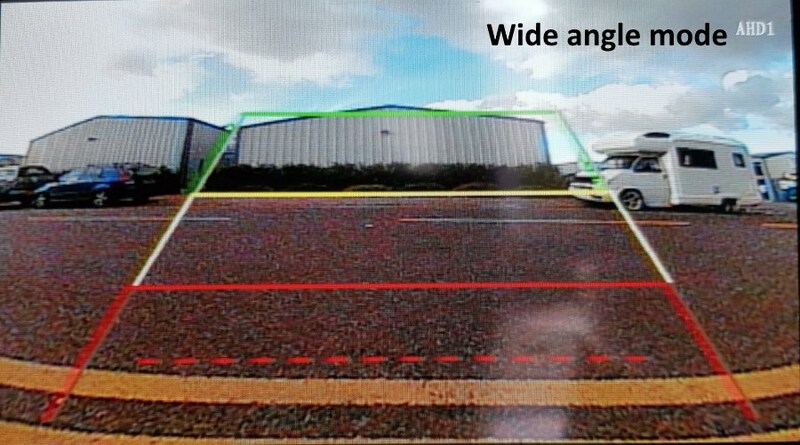 This allows you to see along the bumper of the vehicle and up the road to each side. You only distortion at the extremes of the image. You can turn the guidelines on or off according to your preferances. They are also adjustable using the joystick controller. This image is when the camera is in wide angled mode. Although still at a very wide angle there is little distortion of the image. 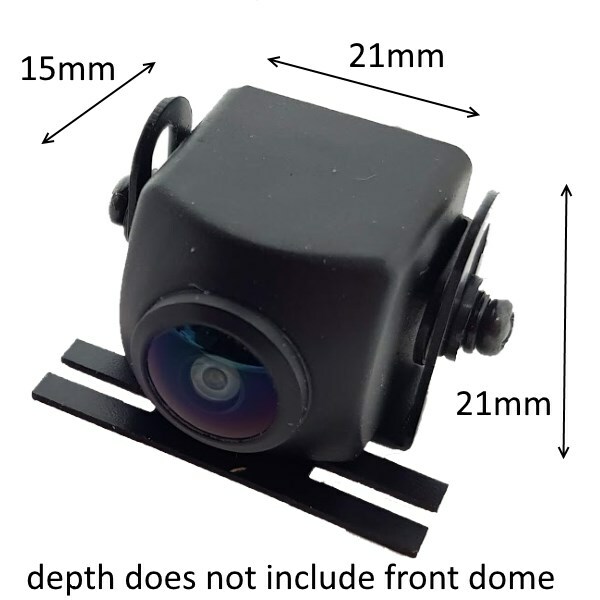 With wide angled cameras they usually produce a fisheye effect which bends any straight lines. One of the modes available is the plan view. 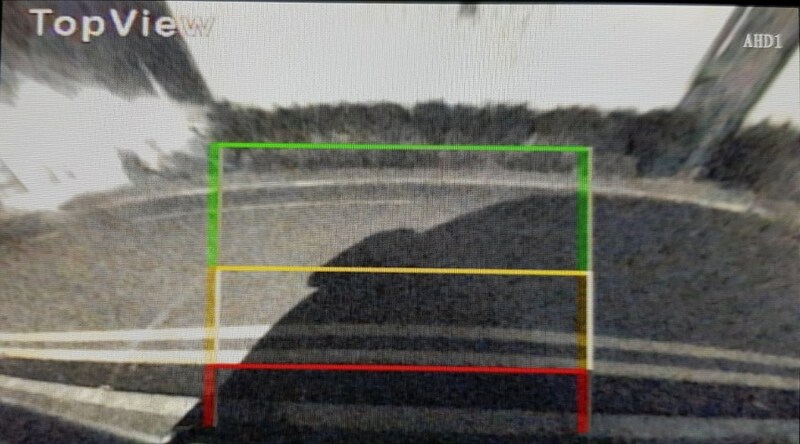 This attempts to create an illusion that the camera is above looking back down at the rear of the vehicle. 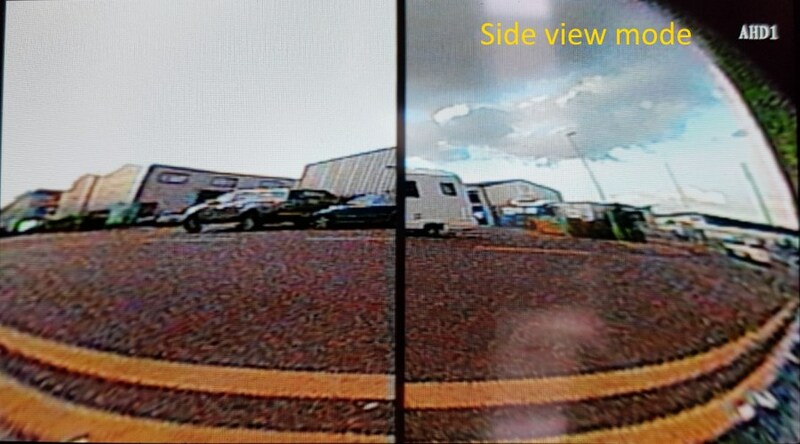 The next screen mode is where the camera is set to look left and right to the side of the vehicle. This can be very useful if you need to emerge from a junction with limited visibility. 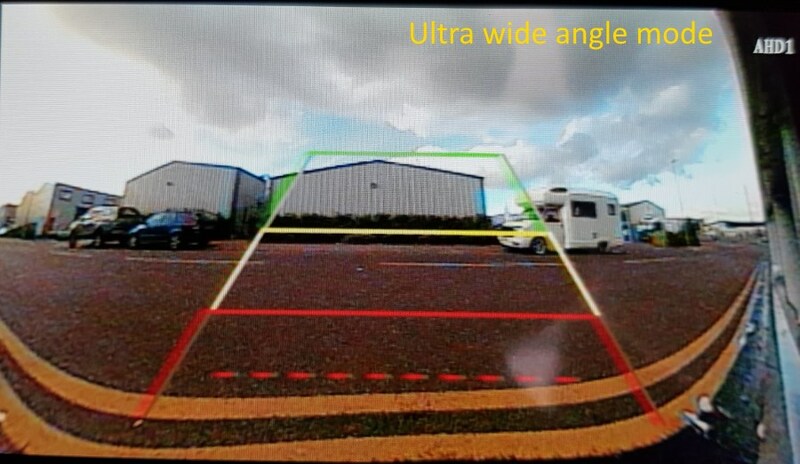 The wide angle of the camera makes objects close to look a long way away, so caution using this mode is advised. The joystick controller allows you to move the images up/down or left/right in relation to each other. You can also rotate to give a wider angle of view along the road. You have the option to combine the side view and the plan view which is what the photograph above shows. This is a photograph of an image produced by a camera at night. Where there is typical street lighting the image is good. There are no IR LEDs so in complete darkness what you see will depend on your own lights. This is the plan view mode working at night.